Kalaee, Mohammad Javad, Katoh, Yuto. (1396). The transition energy and the beaming angle of converted LO-mode waves from 100 to 400 kHz through density gradient according to observations of kilometric continuum radiations in the plasmapause. مجله ژئوفیزیک ایران, 10(5), 1-9. Mohammad Javad Kalaee; Yuto Katoh. "The transition energy and the beaming angle of converted LO-mode waves from 100 to 400 kHz through density gradient according to observations of kilometric continuum radiations in the plasmapause". مجله ژئوفیزیک ایران, 10, 5, 1396, 1-9. Kalaee, Mohammad Javad, Katoh, Yuto. (1396). 'The transition energy and the beaming angle of converted LO-mode waves from 100 to 400 kHz through density gradient according to observations of kilometric continuum radiations in the plasmapause', مجله ژئوفیزیک ایران, 10(5), pp. 1-9. Kalaee, Mohammad Javad, Katoh, Yuto. The transition energy and the beaming angle of converted LO-mode waves from 100 to 400 kHz through density gradient according to observations of kilometric continuum radiations in the plasmapause. مجله ژئوفیزیک ایران, 1396; 10(5): 1-9. The satellite observations such as the Cluster mission with four-point measurements show some local fluctuations in the density gradient in the vicinity of the plasmapause. These structures are found over a broad range of spatial scales, with a size from 20 to 5000 km. Also, the simultaneous observations of the kilometric continuum by IMAGE (Imager for Magnetopause-to-Aurora Global Exploration) and GEOTAIL satellites have indicated another new evidence of a very broad emission. In this study, we considered the mode conversion of waves propagating under the presence of the density gradient in a scale length from 20 to 10,000 km, for a range of frequency from 100 to 400 kHz according to observations of the kilometric continuum. We calculated the transmitted energy flux as a function of the spatial scale lengths and the frequencies. We also calculated the resultant beaming angle for the frequency and the wave normal angle of incident waves. For these cases, results showed that the beaming angle becomes larger and smaller than the angle estimated by Jones’ formula. We suggest that the spatial scale length should be less than about 100 km for the efficient mode conversion and then that the beaming angle becomes consistent with the observed the kilometric continuum. Boardsen, S. A., Green, J. L., and Reinisch, B. W., 2008, Comparison of kilometric continuum latitudinal radiation patterns with linear mode conversion theory: J. Geophys. Res., 113, A01219. http://dx.doi.org/10.1029/2007JA012319. Budden, K. G., 1980, The theory of the radio window in the ionosphere and magnetosphere: J. Atm. Terr. Phys., 42, 287. Budden, K. G., 1985, The propagation of the radio waves: Cambridge University Press. Darrouzet, F., Decreau, P. M. E., De Keyser, J., Masson, A., Gallagher, D. L., Santolik, O., Sandel, B. R., Trotignon, J. G., Rauch, J. L., Le Guirriec, E., Canu, P., Sedgemore, F., Andre, M., and Lemaire, J. F., 2004, Density structures inside the plasmasphere: Cluster observations: Ann. Geophys., 22, 2577–2585. Darrouzet, F., De Keyser, J., Décréau, P. M. E., Lemaire, J. F., and Dunlop, M. W., 2006, Spatial gradients in the plasmasphere from Cluster: Geophys. Res. Lett., 33, L08105, doi: 10.1029/2006GL025727. Ellis, G. R., 1956, The Z propagation hole in the ionosphere: J. Atm. Terr. Phys., 8, 43. Hashimoto, K., Green, J. L., Anderson, R. R., and Matsumoto, H., 2006, In: LaBelle, J. W., and Treumann, R. A., (Eds. ), Review of Kilometric Continuum: in Lecture Notes in Physics, 687, Springer, New York, pp. 37–54. Jones, D., 1980, Latitudinal beaming of planetary radio emissions: Nature, 288, 225–229. Jones, D., 1981, Beaming of terrestrial myriametric radiation: Adv. Space Res., 1, 373–376. Jones, D., 1988, Planetary radio emissions from low magnetic latitudes observations and theories: Planetary radio emissions II, edited by Rucker, H. O., Bauer, S. J., and Pedersen, B. M., Austrian Acad. of Sci., Vienna, Austria, 255. Jones, D., Calvert, W., Gurnett, D. A., and Huff, R. L., 1987, Observed beaming of terrestrial myriametric radiation: Nature, 328, 391–395. 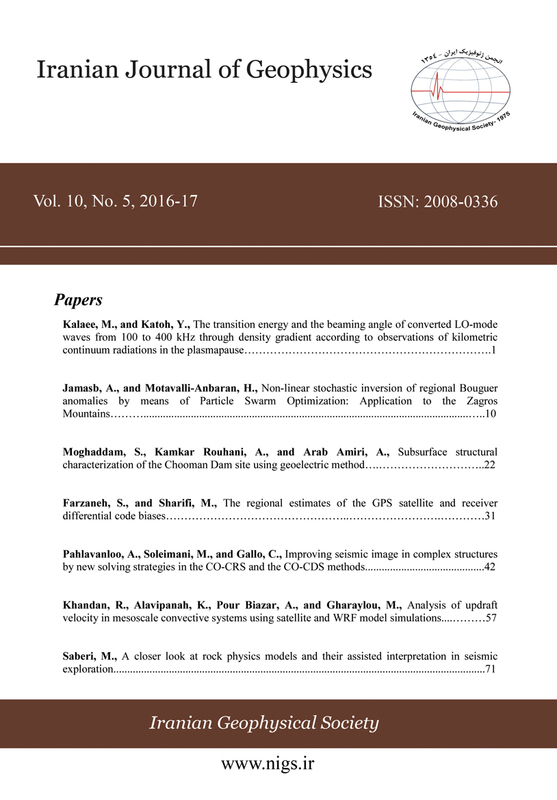 Kalaee, M. J., and Katoh, Y., 2014a, A simulation study on the mode conversion process from slow Z-mode to LO mode by the tunneling effect and variations of beaming angle: Adv. Space Res., 54, 2218–2223. Kalaee, M. J., and Katoh, Y., 2014b, Effects of the angle between the density gradient and the external magnetic field on the linear mode conversion and resultant beaming angle of LO-mode radio emissions: Earth Moon and Planets, 114, 1–15. Kalaee, M. J., and Katoh, Y., 2016, The role of deviation of magnetic field direction on the beaming angle: Extending of beaming angle theory: Atmospheric and Solar Terrestrial Phys., 142, 35–42. Kalaee, M. J., Katoh, Y., Kumamoto, A., and Ono, T., 2010, Simulation of mode conversion from upper-hybrid waves to LO-mode waves in the vicinity of the Plasmapause: Ann. Geophys., 28, 1289–1297. Kalaee, M. J., Ono, T., Katoh, Y., Iizima, M., and Nishimura, Y., 2009, Simulation of mode conversion from UHR-mode wave to LO-mode wave in an inhomogeneous plasma with different wave normal angles: Earth Planets and Space, 61, 1243–1254. Mjulhus, E., 1984, Coupling to Z mode near critical angle: J. Plasma Phys., 31, 7–28. Oya, H., 1971, Conversion of electrostatic plasma waves into electromagnetic waves: Numerical calculation of the dispersion relation for all wavelengths: Radio Sci., 12, 1131–1141. Oya, H., 1974, Origin of Jovian decametric wave emissions — Conversion from the electron cyclotron plasma wave to the O-mode electromagnetic wave: Planet Space Sci., 22, 687–708. Stix, T. H., 1992, Waves in Plasmas: American Institute of Physics, New York. Warren, E. S., and Hagg, E. L., 1968, Observation of electrostatic resonances of the ionospheric plasma: Nature, 220, 466–468.